Google Trends enables you to take popular search queries and explore traffic patterns over time and geography. Now we've added YouTube search data going back to 2008, making it another great tool to look at video trends. 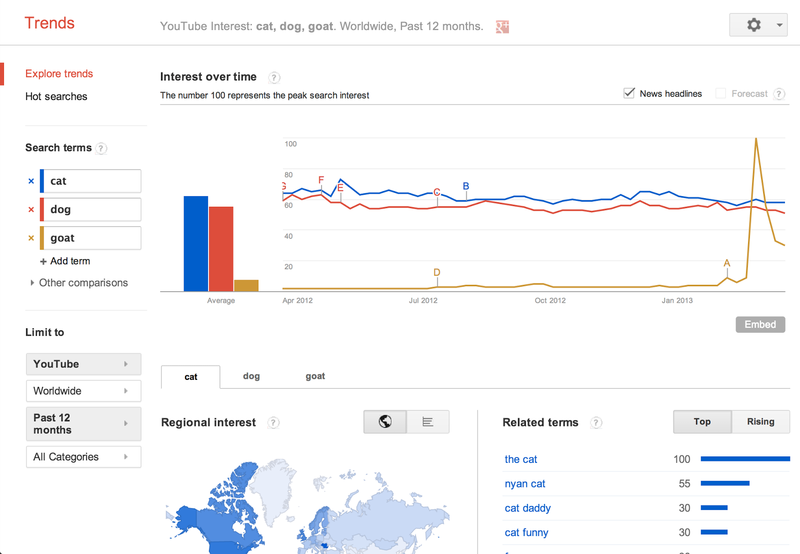 Visit Google Trends and enter any search you'd like and then, on the left, choose "limit to" for YouTube. You can slice by region or category as well. Search query interest can often provide a more detailed picture into the life of a trend or topic. For example: for those of you wondering whether the "Harlem Shake" is over... it's not. You can also see interesting seasonal patterns. For example, cooking searches for "turkey" in the US see dramatic spikes every November as people scramble to remember exactly how to prep that big meal before the relatives arrive. Head over to Google Trends and see what other interesting YouTube searches you can find.